Click HERE to read Charlie's Article. Click HERE to see Charlie Weingroff's review of this year's BSMPG Summer Seminar. Click HERE to read this article by Charlie Weingroff. See Charlie speak in Boston June 4th at BSMPG's Summer Seminar, "Standing On The Shoulders Of Giants" - Click HERE to register. 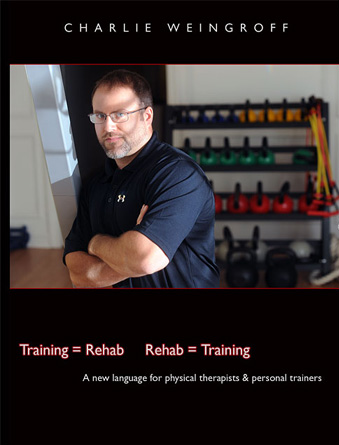 Watch Charlie Weingroff's Webinar on Strength and Conditioning Webinars by clicking HERE. For more presentations by Charlie Weingroff, visit our Past Conference page to purchase the 2010 Basketball Specific Training Symposium DVD or sign up to see Charlie speak at the 2011 event, June 3/4 in Boston. Click HERE to download and view the entire article. Matt Sharky in the UK has been given a great opportunity to direct the training of his country's top junior basketball players from U19 down to U13. This is a tremendous opportunity to represent his country and develop young people that regularly populate the D1 teams in the United States. At his request and my privilege, I will provide some prevailing thoughts that I think are critical in training basketball players. As I warned Matt, my views may not seem as basketball-centric as some would expect. I think athletes are athletes, and from a foundational level, human movement is the same for everyone involved. Obviously the Joint by Joint prevails, but there are singular impacts to the Joint by Joint that I think are more prevalent in basketball players. One is the height of the players. Bottom line is that a longer lever is harder to control. No matter if it's a long femur, longer humerus or spine, length requires more stability. When the muscular and neuro-muscular systems are challenged as they are in these under- or poorly training individuals, the body will rely on bony approximation and ligamentous strain for stability as well as shifts in tone away stabilizers, creating tension in mobilizers such as the hip flexors, hamstrings, calves, etc., all the places we typically see "tightness." Coming from the 5 foot nothing walking fire hydrant, having long levers is not the devil's spit. Longer levers typically come with bigger hands (better to grip you with) and bigger frames like shoulder girdle which provide better angles to buttress the spine. The second point regarding mobility and stability is that most basketball players are what Gray would call Over Powered Athletes. These folks have a Ferrari engine in a ‘72 Beetle frame. The gap between high level basketball players and also-rans is very, very large. The guys that Matt is going to be working with are gifted. They have inordinate fast-twitch fibers and are beyond capable of outrunning their foundational movement dysfunction. Basically, they can still run and jump through the roof at elite levels despite the destruction they are doing to their joints. Now with the adolescents Matt is going to be working with, he can impact their strength and power. But even the U19 guys, he might already be looking at 35-42″ verts. They aren't going to be going any higher. Their durability is going to be where he can help the most. He will have to respect that even when/if strength and power can be enhanced, it must be within the framework of their Functional Performance Pyramid. Whether it's using the FMS or not, I expect training mobility and stability will be the first governor on his player's success. Buddying off of t-spine limitations that you would expect to see above, one of the most underrated aspects of performance is cervical motion. Taller people, much less players, live much farther away from the world. They have to bend over and look down a lot. That forward weight shift in the upper quarter adds up. The documentation of inter-regional dysfunction with poor cervical motion is clear. I also think that tall basketball players shield their height from some sort of shame with the upper-crossed posture. I think in some ways they are embarrassed of their "differences." This biomechanical and emotional stress has very underrated effects on mobility/stability and performance. Check on all of your athletes, clients, and patients if they can EASILY reach their chin to the chest. Get their head almost parallel to the floor looking upwards. Can they turn their head and drop their chin EFFORTLESSLY to touch their clavicle. If they can't, I firmly believe you are leaving inches on the Vertec wheels on the platform, and seconds in the lane. The neck matters for a number of reasons: fascial length tensions that span the entire body, breathing function, spinal stability, peripheral vision, reaction time. If the neck is off, the rest of your body is not optimal. A tight neck is not normal, and it is not efficient. Certainly we will see this more with basketball players. Get a manual therapist on your team to get the neck on the swivel, and then mobility/stability training and proper breathing training is what you can do to lock it in. Certainly this principle applies to everyone, but the t-spine is a major offender again from the length and typical in-game postures of a basketball player. I think the T-Spine is as big a part of this ideal stereotype of spinal stability as it can impact the neck as above, the scaps, the low back, and the ribs as they would pertain to breathing techniques. Not only do we need t-spine mobility, but the tall spine posture from the crown of the head all the way down to the buttcrack should be long and stiff during all stability training. Maybe even call it T-spine stability. Longer levers are harder to control, but maybe it means just less or smaller progressions in external load. Long levers are never going to get someone to APF Elite or up on the board for top benches and squats. But that doesn't mean they aren't strong. This principle holds for anti-spinal movement training and level changes. One of the best teaching tools for this is what I call the Frog Squat, where you take a DB or KB and hold it in goblet position and let the system drop you into a squat. All the while you are packing the neck in and getting tall in the spine. Every push into your spine should get you deeper into your hips. It's a nice teaching tool for the tall spine along with posterior pelvic tilt in all anti-extension positions. As basketball players are often poorly educated in their training, need it be said that flexion training is complete nonsense even more so when you are taking a larger lever into a bad place. This equals more damage and an even larger struggle to crack out of the neuromuscular nut. I would also like this principle to govern the limbs. Less load, FULL length through mobile segments of the shoulder (pull-ups, push-ups, bench press), hips (all level changes), and ankles (Deep Squat training). Especially in novice trainees, strength training should be mobility training inherently. Get LONG. Control length by going through length with limited load. Longer limbs have bigger risk/reward. Weak or inefficient athletes have "heavy" enough limbs. This is maybe what some are expecting when talking about a basketball player. Obviously knees and ankles are common injuries. And through the Joint by Joint, we should believe that ankle mobility, hip mobility, and core stability should beget good knee stability. I think that's true, but it's not the whole story. The problem is that the basketball jump shot is inherently wrong everywhere. Heels are off the ground. Knees jut forward. Minimal hip hinge. Forward arms and head. If you saw this in the Deep Squat, it would look horrible, and in fact, I would gamble aggressively that most competitive basketball players not exposed to good training would score a 1 if they were pain-free on the FMS Deep Squat. But what is crucial in the jump shot is to maintain a straight up line of verticality to elevate over the defender's outstretched arm. You HAVE to use a bad squat to shoot successfully. And with that in mind, the knee pays the price. Poor surrounding mobility and stability AND knees jutting forward instills tremendous compression retro-patella and posterior meniscus. As the knee continues to flex, there is shearing of the femoral head against the back of the patella. Here is the bony stability that I mentioned above. Try this yourself. Just jut your knees forward without sitting back. Your knees will talk you out of depth. This crash is what an NBA rookie has already done maybe a billion times in the jump shot. With this in mind, I would ask you to consider the vertical tibia in the box squat, dead lift, rack pull, and split squat as the evidence clearly supports deloading the knee with those techniques. There are both 1- and 2-leg options with the vertical tibia, and as I've mentioned before, loading is barely even necessary. I just came back from dinner with Bill Foran among others here @ Pre-Draft, and he described teaching Shaq to squat when he came to Miami with just all bodyweight. The beauty of this training strategy is that I believe that the hip-dominant level changes create a posterior glide of the femur away from the retro-side of the patella, and when the real life movements of the real world are attempted, the compression has been attenuated. While I am sure most would agree this is useful to restore the painful knee to non-painful, I also believe that this technique will improve performance. Clearly the posterior chain is a limiting factor to a quad-dominant squat, so if we can adjunct quad-dominant and hip-dominant choices, skewing power to quad- and strength to hip-, I think there is an accelerated balance and restoration of knee and spinal joint centration. With ideal centration in these "stable" segments, I have every reason to expect performance to improve and stave off pain. I firmly believe that folks that do not have pain simply do not have pain.........................yet. My recommendations in this topic are box squats (high if necessary and with specialty bars to keep the bar high), deadlifts or more likely rack pulls starting at a height slightly lower than your dowel, split and RFE split squats with a long stride and vertical tibia (90/90 on the bottom). I do not think basketball players should catch the OL. The first and 2nd pulls meet these standards. The catch does not. A 1-leg unsupported squat can be done with a vertical tibia, but I'm not sure many individuals can do it. 1-leg unsupported can also be performed with a box squat technique, but these do not seem to be very challenging. I think most people just plop if not coached well. Certainly these techniques have little honor for ankle mobility, so this must be maintained elsewhere, as well as integrated the full Deep Squat movement with such options as the Frog Squat or Toe Touch to Squat. These suggestions are not an excuse to load up 3,4,5 wheels on a side, lock the bar low on your back, and sit back into an above parallel squat. That is trash. That technique is just an excuse to crush your spine and demonstrate that you don't belong in that squat. Perhaps less rhetoric and theory and more meat and potatoes, these are the exercises I think have most application to fundamental movement and performance for basketball players or any individual. Shoulder-based: Push Press, Pull-ups, Push-ups, Inverted Rows, Bent over rows. To answer the 2nd question first, very simply, the answer is that my approach with a basketball player does not differ from any other sport's athlete. This philosophy is based on the notion that we must screen and assess basic fundamental presentations of mobility and stability before negotiating strength and speed. Certainly while important for all athletes, I think the inherent movement challenges of the tall athlete as well as one that plays basketball puts these qualities at the forefront. The standard height of the basketball athlete typically yields a shift away from muscular stability towards passive stability of using tension of muscles, ligaments, and bones to support controlling a movement. Given the longer segments of the spine, arms, and legs, and relatively low training age of most basketball players, the qualities of bodyweight movement far supersede those of power and agility. Nearly all the time, improving fundamental movement patterns will be default improve the sexier qualities of vertical jump or power clean. Coupling these natural tendencies for inefficient movement patterns, the inherent poor biomechanics of the jump shot add to the ingrained motor patterns governing the neuromuscular system. These are the patterns that I think hold priority for my attention in evaluating/treating a basketball player. Most people are very excited to be very good or even great at what they do. Less strive to the be best they can be every day. Very few strive to be better than everyone else at what they do every day they have the opportunity to impact someone. There is a right way and wrong way to climb the ladder, but if you can manage a healthy and productive way to be better than everyone else, to be a leader in everything you do, you will automatically be the best you can be, and automatically be great. Maybe this is theoretically impossible, but if you try, you gain everything else by default. One thing I am not humble about is my drive to be better than everyone else. I am clearly not the smartest, most successful, or most charismatic, etc., but leaving nothing on table allows one to be best they can be. I believe the literature has reported basketball at the national level to be played at a 1:6 work:rest ratio. This suggests for every 10 seconds of movement, there are 60 seconds of rest. This is fairly staggering for a sport requiring such a conditioning demand. Certainly these sport-requirements dictate an interval-based training program, or at least one that allows for very high intensities or VO2 max in the "on" interval and substantial rest in the "off" of the interval. Given the facts that many coaches believe in long distance training, I do not force feed any specific intervals for basketball programming. Just do intervals! Whether it be linear patterns like ladders or 17s, etc., these are all relatively shorter distances that qualify by broad based definitions of interval training. Perhaps I should define this as High Intensity Interval Training, recently popularized by the informal literature review from Dr. Mark Smith. My philosophy relies of tremendous intensity followed by longer bouts of rest. Playing with on/off times are fun, and I am more interested in the approach than the ultimate efficiency of using only certain numbers. If at all possible, using heart rate monitors during training is my preferred approach. I think Heart Rate Variability (HRV) is the ultimate indicator of conditioning. This in a lay way is how quickly the body restores a resting or submaximal heart rate. We may end an interval after 20 seconds @ a heart rate of 185, but Athlete 1 returns to 140 in 20 seconds, and Athlete 2 takes 60 seconds. Clearly Athlete 1 is in better physical shape. RPE can also be used to run the restart of the interval. The beauty of this type of training is that it lends brilliantly to very respectable times in a 1 and 2 mile runs or 10 mile bike time trials, which I think have a role in motivation during pre-season testing. Please discuss your philosophy on taping/bracing ankles. Does this cause problems elsewhere? What are the advantages of taping/bracing? My philosophy is something is better than nothing, but it needs to be the right something. This surely sounds confusing, so please let me explain. There is no doubting the thought process popularized by Mike Boyle's Joint by Joint Theory that a loss of ankle mobility can foster knee pain in level changes. These level changes would include any strength training or athletic movement requiring a drop of the center of gravity. If a loss of ankle mobility is in the sagittal plane, this will cause an increase in anterior knee compression. If there is a loss of ankle mobility in the transverse plane, medial knee pain is more the probability. These instances are regardless of any taping or bracing choice. Certainly using an external modality for stability such as taping or bracing will decrease ankle mobility and lead to knee pain. Instances of knee pain in basketball certainly are very high. Is it the poor eccentric control upon the landing that causes jumper's knee, or is it the lack of ankle mobility adding to joint compliance and ideal force dispersion through deceleration? If the goal is to limit ankle sprains with the taping or bracing, we should also be quite aware that hip and core stability beget ankle stability. But as I said, something is better than nothing. I believe proprioception can be gained from elastic tape jobs that actually provide very little support from an osteoligamentous standpoint. Maybe a neoprene ankle sleeve with an open heel would serve the same purpose. I believe this proprioception at the skin level can be very useful in "increasing the speed limit" on mechanoreception to the brain in bouts of potential ankle sprains. Less is more, but the anti-ankle sprain muscles live in the hips, not the ankles.